Hi-Wire Brewing has been absolutely killing it since they opened two years ago. Their taproom is always busy, they recently announced the location of a new production brewery, and the beer's good. Really good. It seems like not so long ago that 40 IBUs was pretty standard for an IPA. These days, if an IPA doesn't wreck your palate, it isn't hoppy enough. 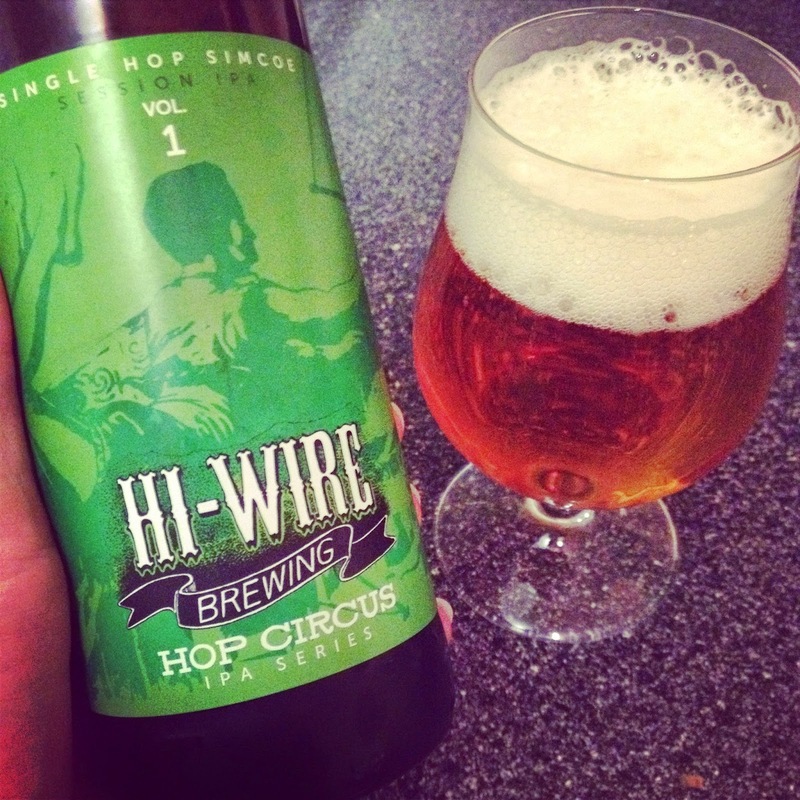 Hi-Wire's Single Hop Simcoe Session IPA, on the other hand, is well balanced at 40 IBUs & 4.8% ABV, so the 22 oz. bomber won't knock you out. The brewers did a great job executing the Simcoe hop flavor, which can easily be overdone. Balance, according to Hi-Wire co-founder Adam Charnack, is head brewer Luke Holgate's hallmark, and I have to agree. In this beer, those Simcoe hops give this beer an expertly restrained grassy, herbal flavor, supported by soft, sweet malt in the background. So what else might Hi-Wire be working on? When they open their new facility (which could be as early as this summer), the current brewery will remain a creative outlet for some of the more adventurous beers they like to make. Examples might include beers like their dry-hopped Belgian, brewed with SouthYeast yeast harvested from a local nectarine, Riverbend malt, and El Dorado hops. Or maybe more hop forward beers like Maneater Double IPA. And seeing as this single hop beer was labeled "Vol. 1," hopefully many more expertly crafted single hop brews will be coming down the line soon.